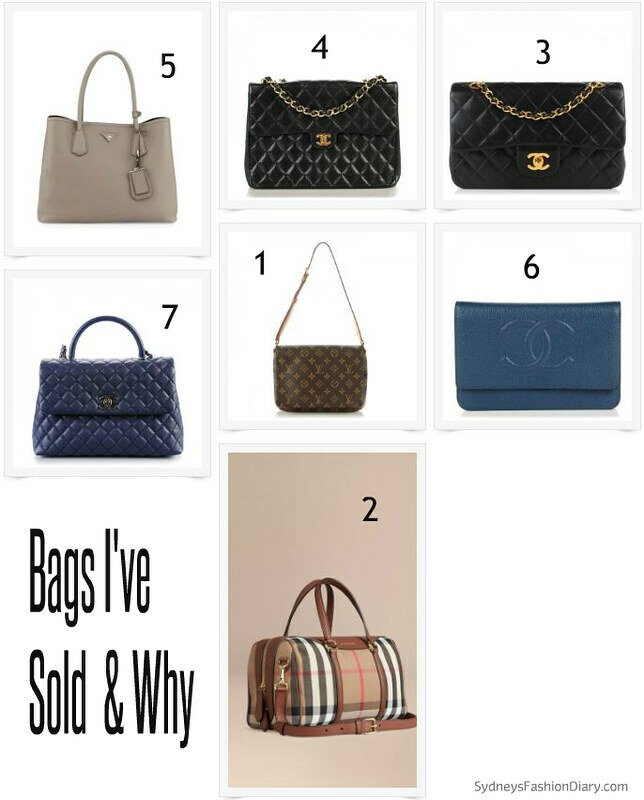 For this week's handbag chit chat, I wanted to talk about bags I've sold in the past and why. Living in a very small town of Ohio, I don't always have the opportunity to see certain bags in person. My local Saks does not carry Chanel, Prada or Celine. Sometimes, you just have to use the bag to know if it's right for you. Also, style evolves. I sold bag # 1 and # 2 for the same reason. I was no longer into obvious logos. I bought the Louis Vuitton bag in 2004 and absolutely loved it. However, the older I get, the less interested I am in carrying around a bag covered in logos. Bag # 3 was my very first Chanel bag. Even though I've done quite a bit of research, I was still a newbie. My very first Chanel bag was a small classic flap in lambskin with gold hardware. After using it for a year, I decided that the combination of lambskin and gold hardware isn't for me. I always tend to lean towards silver jewelry. I sold bag # 3 and got bag # 4 as a replacement. I thought I was happy with the caviar leather + silver hardware combo but the jumbo size was way too big on my short frame. I ended up selling it and got the medium classic flap in caviar leather with silver hardware. It's truly perfect (should have bought that in the first place)! Last year, I realized a tote bag was missing in my collection (and still is). At the time, the Prada Cuir bag was popular but I couldn't find any decent reviews. I made the purchase rather quickly. However, it didn't take me very long to realize the bag is just too big for me. I had a hard time filling it up. Even though, I don't own the bag anymore, it still has a special place in my heart. Maybe, one day I'll repurchase it in a smaller size. Up until then, all my bags were in neutral colors. When I saw the Chanel chevron wallet on chain in red, my heart skipped a beat. I knew I had to let go one of my bags in order to fund a new purchase. Naturally, bag # 6 had to go. I am super in love with my new WOC. The color is seriously to die for. Bag # 7 was an impulse buy. The Hermes Kelly is my ultimate dream bag. I had no idea when I will be able to obtain the bag. When I saw the Chanel coco handle, I though it would be perfect to hold me over until I get my dream bag. The opportunity came up sooner than expected. I was more than happy to find a new home for bag # 7 to fund my ultimate dream bag. I am still pretty much in love with the coco handle and would have kept it if I have the funds. If you're thinking about buying one of these bags, I hope you find this post helpful. Unused handbags are like having money sitting there on your shelves collecting dust. My handbag collection is super tiny but it's everything I dream for and love (and that's the way it should be). Have a great weekend, everyone! Great posts! I'm happy you have a collection you love! That's how it is supposed to be! Happy weekend Sydney! Any good website that you could suggest to sell bags that you own?